Getting Gennady Golovkin vs. Vanes Martirosyan instead of Golovkin vs. Saul Alvarez has left me feeling cheated by Alvarez and his two positive tests. It reckoned to be one of the most intriguing rematches in boxing history. Now we have to hope that Martirosyan does not prove to be a banana skin for Golovkin-highly unlikely- and that Alvarez stays away from Mexican meat so we can get the fight in September. If it does come off in September then Alvarez will have been inactive for a year which can’t help his chances. That leaves the other big question as to whether we will get to see Anthony Joshua vs. Deontay Wilder. At this moment this is not a fight between Joshua and Wilder but their respective promoters who are both desperate to stage the fight. Eddie Hearn wants it in the UK and Shelly Finkel wants it in the USA. Hearn offered Wilder $12 million and Finkel responded with an offer of $50 million. Hearn has responded by asking to see the contract and Finkel has replied by saying that for some past fights Hearn has offered and had agreement on purses first and discussed the contract afterwards. This really is just a couple of businessmen playing games. A purse of $12,000,000 may not seem much when you compare it to $50 million but it is a very large amount when you consider that the most Wilder has been paid for a fight was the $2.1 Million for the Ortiz fight whereas Joshua earned around $27 million for the Parker fight. Even if Hearn said he would accept the $50 million offer I can guarantee you that the chance of a contract being agreed would be somewhere south of nil and the $50 million would prove to be smoke and mirrors. Joshua gives Hearn the strong hand in these “negotiations” Wilder needs Joshua a lot more than Joshua needs Wilder. 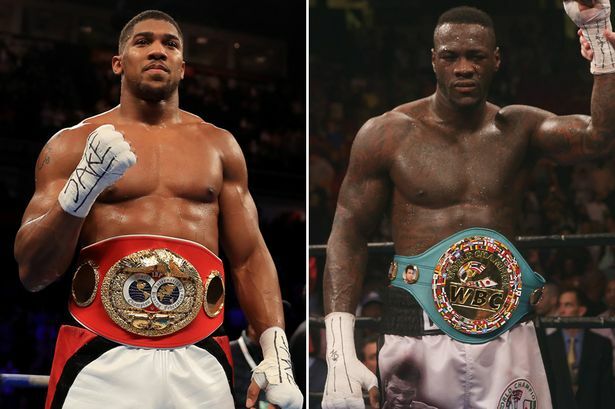 For a fight with WBA/WBO No 1 Alex Povetkin, although not as big a draw as Wlad Klitschko or Parker, Joshua would still take home about four or five times more than Wilder could earn against WBC No 1Dillian White, No 2 Luis Ortiz or No 3 Ortiz so if money talks Joshua shouts and Wilder whispers. Let’s hope some sense creeps in to these media games and we get the fight we want. At least we will get Tony Bellew vs. David Haye on Saturday and let’s hope there are no injuries and no controversies and it end up being a great heavyweight scrap that gives us some clarity on which direction these two fighters are heading as it will throw another hat in the UK ring alongside of Tyson Fury and Dillian White. So much shuffling has been going on lately that it makes me dizzy. Apart from Golovkin vs. Alvarez falling by the wayside and Vanes Martirosyan being parachuted in from nowhere we had Liam Smith having to pull out of the WBO title fight with Sadam Ali and Mexican Jaime Munguia coming in, Eider Alvarez reportedly switching his focus from Adonis Stevenson to Sergey Kovalev, Keith Thurman vacating the WBC welter title and Dillian White being shifted into a siding to fight Luis Ortiz so that the Anthony Joshua vs. Deontay Wilder gravy train can steam on towards huge sanctioning fees. The typical machinations have gone on to approve and try to enhance the Golovkin vs. Martirosyan fight. With Martirosyan being drafted in even though he was not rated in the top 15 middleweights by IBF, WBA or WBC when the fight was announced. He was No 1 super welter with the WBC so their rules allow them to approve the fight as long as you don’t question how a guy who had not had a fight since losing to Erislandy Lara two years ago can qualify for the No 1 position. The WBA just did a bit of cynical manipulation and Martirosyan magically appeared at No 12 in their ratings. Well at least we have Jorge Linares vs. Vasyl Lomachenko to look forward to on 12 May. The good thing about the fight is that Top Rank and Golden Boy have worked together to make it happen. It will be a remarkable achievement if Lomachenko wins to become a three-division world champion after just 12 fights. On the other hand Linares can show that some fighters improve with age. When he lost back-to-back fights to Antonio DeMarco in 2011 and Sergio Thompson in 2012 it looked as though he might just be sliding down the slope. Now he has won 13 fights in a row and captured both the WBA and WBC lightweight titles and of the seven world title fights in that sequence only one has been a home town fight. Two great fighters it is just a pity that they can’t both win and I always find a draw an anti-climax so I go for Lomachenko to come out on top. There are no big fights on the undercard but no shortage of probable stars of tomorrow in Michael Conlan, Carlos Adames, Fazliddin Gaibnazarov and Teo Lopez. Mikey Garcia of course is already a four division champion having held the WBO feather and super feather title and the WBC light and IBF super light titles. He lost the WBO feather when he failed to make the weight and vacated both the WBO super feather and now the IBF super light, He has chosen to go back down to light to try to lift the IBF light title against Robert Easter. If he wins then a fight with the winner of Lomachenko vs. Linares would be the next target. His move leaves the super lights looking light with the WBO and IBF titles vacant and neither WBC champion Jose Ramirez or WBA champion Kiryl Relikh big names yet and right now it is a division bereft of any high level stars. The position in the WBC lightweight rankings should be cleared up soon with No 2 Luke Campbell getting a chance to reverse a loss against No 3 Frenchman Yvon Mendy. That one is awaiting the outcome of private negotiations between the parties with a deadline of 27 May for agreement or it will go to purse offers. It was good to see Isaac Dogboe fulfilling the hopes of Ghana by winning the WBO title. Perhaps it will give the sport a boost in his homeland and it needs it as there is not a lot of money in the sport there and the Sports Ministry does not seem to realise the boost the country gets from achievements such as this. Money, interest and investment in football is head and shoulders over all other sports in African countries and successes such as those enjoyed by Dogboe are earned despite rather than because of the Government there. Spaniard Kevin Lejarraga was impressive in destroying Bradley Skeete inside two rounds and his win should also give Spanish boxing a boost. He comes from the Basque country and they breed them tough there although as far as I know the region has never produced a world champion. In Paulino Uzcudun they had probably the best heavyweight Spain has produced. He was Spanish and European champion and also somehow managed to win the Colombian title. He faced most of the big names of his day such as Joe Louis, Max Baer, Primo Carnera, Max Schmelling, Mickey Walker etc. Another well know heavyweight from there was Jose Miguel Urtain who was also Spanish and European champion. They both made their names before boxing by their feats in localised specialty sports. Uzcudun was a champion wood chopper and “Wood Chopper” became his nickname. Urtain was a champion at stone lifting another local sport. He could life a 220lbs rock with one arm and 400lbs with two. He was very crude but won his first 28 fights by KO/TKO and at one time there was said to be a $1 million offer on the table to Joe Frazier to fight Urtain in Spain. He won the European title by beating Juergen Blin. He lost it to Henry Cooper only to regain it by stopping Jack Bodell and again lost it to Blin. Obviously there are hopes on the West Coast of Spain that they might find their first world champion in Lejarraga. National pride or face is very important to Japan and the Japanese Commission have reacted strongly to Daigo Higa’s failure to make the weight for his title defence against Cristofer Rosales as it is the first time a Japanese fighter has failed in this way. He is in disgrace as is his coach Hall of Fame fighter Yukio Gushiken. The Commission has suspended Higa indefinitely and he has been fined 20% of his purse and he will undergo a period of monitoring on his conditioning before being considered for reinstatement. It is by no means a rare occurrence elsewhere these days and very little is done to tackle it and the punishments tend to be derisory. Just like banned substances the will to tackle it seriously and deal out severe punishment is just not there. Strong words are spoken and weak action is taken. The Canadian scene will see unbeaten super light Mathieu Germain (14-0) take on Mexican Christian Uruzquieta (17-3-1) in Montreal; on 23 June for the vacant IBF North American title. Uruzquieta is 2-1-1 in four fights in Canada. Also on the show will be Steve Butler (23-1-1) vs. Carson Jones at middleweight with 18-0 Erik Bazinyan also billed to appear. Before that on 26 May in Quebec City David Lemieux returns to start his rebuilding after being outclassed by Billy Joe Saunders and faces French champion Karim Achour for the WBC International and Francophone titles. Unbeaten Custio Clayton is also on the show with Dutchman Stephen Danyo in the other corner as they fight for the IBF and WBO International titles. As Lemieux tries to keep his career alive Jean Pascal is winding his down. The Haitian-born Canadian was hoping to get a place on the Adonis Stevenson vs. Badou Jack show on 19 May but is now looking towards a show in 29 June in Montreal. So Achour hopefully will get a good payday in Canada but Back in France although handed a one year suspended ban by the French Boxing Board Olympic gold medallist Tony Yoka has been asked to appear before the French Anti-Doping Agency to explain his missed tests. They took over Yoka’s file and it is not impossible that they will deal more harshly with him than the French Board as they usually hand out a two year ban for three missed tests depending on the degree of fault of the boxer. Still on France Karim Guerfi announced his retirement, The 31-year-old bantam was knocked out in four rounds by Filipino Michael Dasmarinas in Singapore on 20 April in a fight for the vacant IBO title. In his other attempt at a world title Guerfi lost on points to Juan Carlos Reveco for the interim WBA fly title in 2012. On the plus side he was twice European bantam champion. Also sorry to read of the death at 73 of Argentinian boxer Miguel Angel Campanino. I followed his career from its start in 1966 to it close in 1978. He won the Argentinian and South American titles and ended with a 93-5-4 record having won his last 12 fights. He challenged Pipino Cuevas for the WBA title in 1977 but was knocked out in two rounds. He is shown as having lost twice by KO/TKO but the other loss was when he was forced to retire with a dislocated shoulder and in fact the defeat against Cuevas was his only loss in his last 56 fights. When he retired he opened a gym and had a sports goods business. RIP Miguel Angel. I can understand why BoxRec and the sanctioning bodies have started using the birth names of Thai boxers. There has been a tendency for Thai fighters to adopt as a last name the name of their gym or their sponsors so that name could change. I have found in the past that whilst they might change their last name they usually stick with their first name and I have used that. When reporting a fight or referring to them in a news item for current high profile Thai boxers I am going to continue to use their first name. This is partially to give continuity but if I am being totally honest I would rather refer to Kongfah than Jakkarwut Majoogoen I don’t have enough years left to go typing names that I have to move my lips from letter to letter to type. !